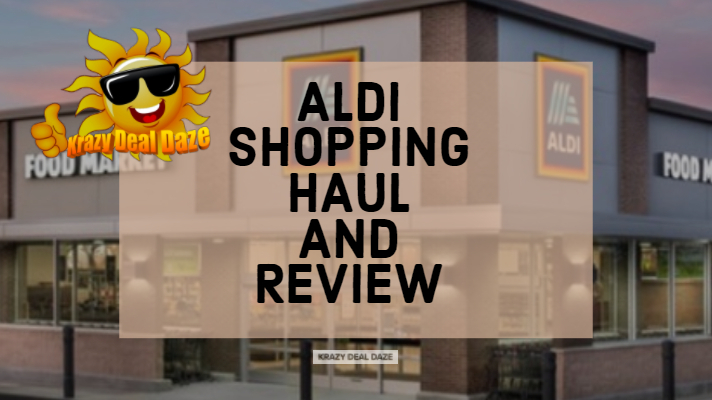 In the spirit of saving money and finding as many Krazy Deals as we possibly can, we decided I should finally make a trip to our local ALDI’s and see what all the talk was about. I had never heard of ALDI until one moved into our town and it seemed like overnight they popped up in every town around us. For those that may not be familiar with ALDI, they are a discount supermarket chain. According to their website, ALDI was “founded by the Albrecht family, the first ALDI store opened in 1961 in Germany, making ALDI the first discounter in the world.” When our local ALDI store first opened we did go and check it out, however, we did not purchase anything at that time. Our first impression was that it was very similar to a Save-A-Lot, which is another discount supermarket chain and just like ALDI you bag/box, your own groceries after check out. Also, when you go to ALDI make sure to arrive with a quarter in hand, because you’re going to need it if you want to use a cart for shopping. You will get your quarter back when you return the cart. So with my grocery list in hand, I embarked on my ALDI shopping journey. The store was clean and well organized and neatly zoned. I like that Aldi offers its own brands like LiveGFree for those of us that have gluten sensitivities. Some of the other ALDI brands offered are SimplyNature, Fit & Active, Earth Grown, Never Any!, Specially Selected, and Pueblo Lindo. 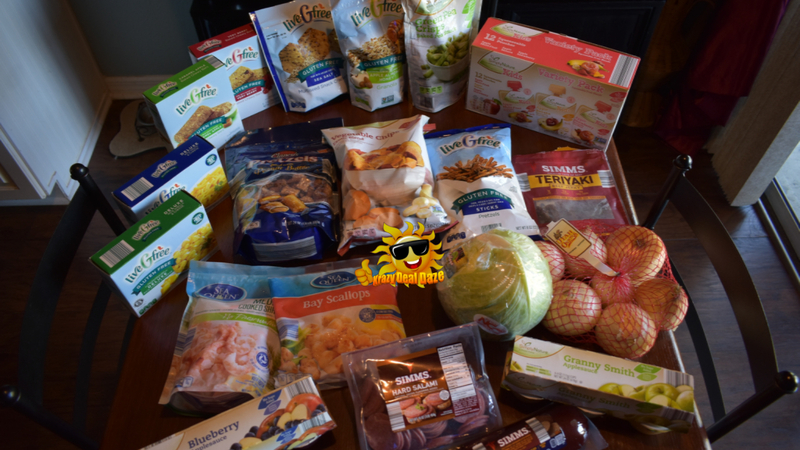 For this trip, I only tried the LiveGFree and SimplyNature ALDI brands. So out of everything I got, we were all pleasantly surprised that everything tasted really good. The quality, textured, taste, of each item I purchased was all good. You would have never guessed that any of these items came from a discount supermarket chain! We plan on going back and trying out their other brands as well, also some of these items have now been added to my regular grocery list and pantry staples! So, did I save any money? Well, let’s compare! We saved a total of $15.39! Overall I feel like this shopping experience at ALDI was a complete success. The products were great and we saved some money! We here at Krazy Deal Daze gives ALDI ⭐⭐⭐⭐⭐! Do you have an ALDI near you? Have you ever shopped at ALDI? How was your experience? What did you think of the quality of their products? I would love to hear your thoughts in the comments below! I have never heard of Aldi. I read it first time. But all these items only at 15.39$ it sounds unbelievable. Simply wow. There don't appear to be any up here in Canada but perhaps they are on their way. I see on in Niagara Falls which would be closest to me. It's my first time to hear about Aldi. I wish they also have a branch near my place. I'm in for savings! How we wish we were there ! We would love to have such crazy deals to shop ! Aldi is such a great store. I am always really surprised bu how much you can get for your money. It looks like you got a lot of great things in your haul. Aldi is a great store to shop at! I love the design of the store! Looks like you made out great on your trip! Wow! One hell of a shopping haul where you save that much money. Shopping on deals can be very financial savvy, right? And as much as I haven't heard of ALDI, I can tell that you're already their satisfied customer. Awesome! I have never heard of Aldi but it seems as if they have a great selection of items. Awesome Aldi! This was a great saver for our normal shopping. The prices were at a great discount/deal and I'm sure people should rush to save as many dollars as they can. Great review. Aldi looks like a nice store. Great deals for many products. I have never been to Aldi although one is not far from me. My friends who go love it. I guess it is time for me to check it out. I have never heard of Aldi. I don't think we have them around here. But I love the prices. I have never heard of Aldi and I guess its not present in Middle East but it seems as if they have a great selection of items. I live in the UK and we have an ALDI pretty close to us. It is definitely our choice of shop because it is such good value! I also love the range of products they have there. We love shopping at Aldi. They have such a great variety of food for such a great price!